It is with heavy heart and great sadness that the family of Muriel G. Haryett announces her passing after a long battle with Alzheimer’s Disease on October 15, 2015 at the age of 97. Muriel is survived by her husband and best friend of sixty five years, Rowland (Bus) and her loving son Kent. She leaves behind a brother, Robert, 5 nephews; Brian, David, Michael, Robbie and Billy and, 5 nieces; Shawna, Paula, Colleen, Carol and Cindy and numerous grand nephews and nieces. 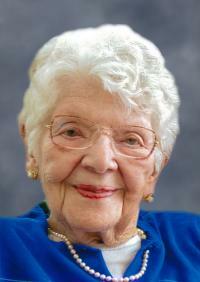 Muriel was born in Toronto, Ontario on August 31, 1918 and was the oldest of four children to Robert and Mary Ralph. She was sister to Helen and William who predeceased her, and to Robert. To ease the burden on her family during the Depression years, Muriel went to live with her grandmother and great-grandmother where she learned the arts of cooking and baking, for which she remained well known, and how to run a small business. She was an avid athlete while at school, running track and field and playing women’s softball. After graduating from high school, Muriel went to work at the University of Toronto as a laboratory assistant with the polio research team. It was during this time she met and ultimately married the love of her life, Rowland (Buster) Haryett in 1949, and agreed to accompany him to Edmonton in 1954 leaving behind the bright lights and sophistication of Toronto for a small, growing prairie city. In 1959 Muriel and Bus had their one and only child, Kent, named after their first and one of their dearest friends in their new city, Kent Purdy. After the birth of her son, Muriel remained at home providing a loving and rich home to her family while being actively engaged in a large number of charitable organizations including the P.E.O., I.O.D.E. and the United Church Woman’s Group and spent many years working as a volunteer at the Misericordia Hospital. She was well known for her kindness and generosity and for the soundness of her advice. Her love of sports remained throughout her long and happy life. Whether on the golf course or curling rink, or fishing in the rain, watching her beloved Blue Jays or Eskimos or playing bridge, Muriel was game for anything. Throughout her life and through her long struggle with that cruelest of diseases, Muriel had the love and support of her family, and in particular the daily tenderness and devotion of her husband, Bus. A Celebration of Muriel’s life will be held at Robertson-Wesley United Church, 10209 – 123 Street, Edmonton at 2:00 PM on Thursday, October 22, 2015 with Reverend Karen Bridges presiding.